While working with some young and very talented project managers a few days ago, I posed the following question: „If there was absolutely nothing to stand in your way, and money played no role, what job would you be doing”? I got very different answers and the jobs mentioned were not what the PJ’s are currently doing . It made me worry, and think of Einstein. I understand there are times when you just have to do what you have to do; like earn a salary to pay bills, go on summer holidays and do fun things like skills and language courses at SALT . The thing is to stay focussed on who you want to be and what you want to become and not get lost in external and internal “noise”. Carry on dreaming and scheming – or risk becoming a grammatical expert in conditionals (“if I had known what I know now, I would have…” or “I wish I had done XYZ when…” or “If only I had…”). We waste too much time and energy fretting about challenges we might have to face at some unknown point in the future or about the mistakes we have made, or trying to live up to others’ expectations – and not pleasing anyone including ourselves . Isn’t it time to stop deferring what you want most? You possess everything you need to move into your unknown and to succeed. You lack nothing. All you have to do is dream, scheme and then commit. Your success will be in direct proportion to your commitment. Why not do an NLP Basic Seminar which the Mnemo Academy in Vienna will be hosting? Why not do a Skills or Language course at SALT? The extra tricks and fun come at no additional cost and the seminars will definitely help you move closer to your dream! Are you ready? PS: “What if ” is limiting. 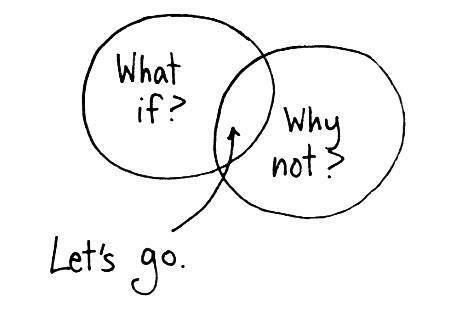 “Why not” is limitless. Try this simple little exercise: Take a look at the various quotes on this page and then ask yourself “Why?“. “Why change?” . Then ask yourself “Why not?” Simply that. You’ll be amazed at how energising and inspiring two words can be.